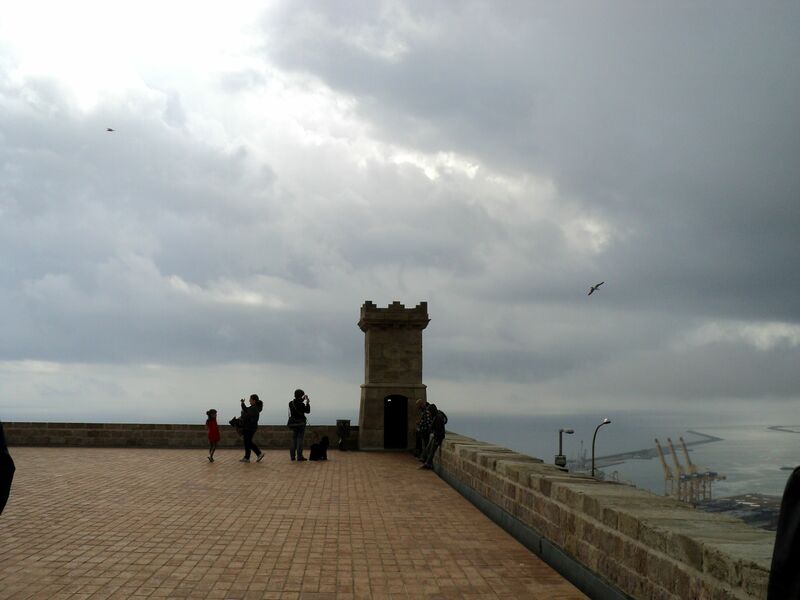 On Friday, we visited the military fortress on top of Montjuïc, the big hill to the south of the city. The view was pretty good from up there. We also visited the Palace of Arts, which is on the other side of the hill. It had a few very interesting works by El Greco that I was glad to see, and one painting of the blinding of Samson that I had never seen before. I wish I remembered the name of the artist. 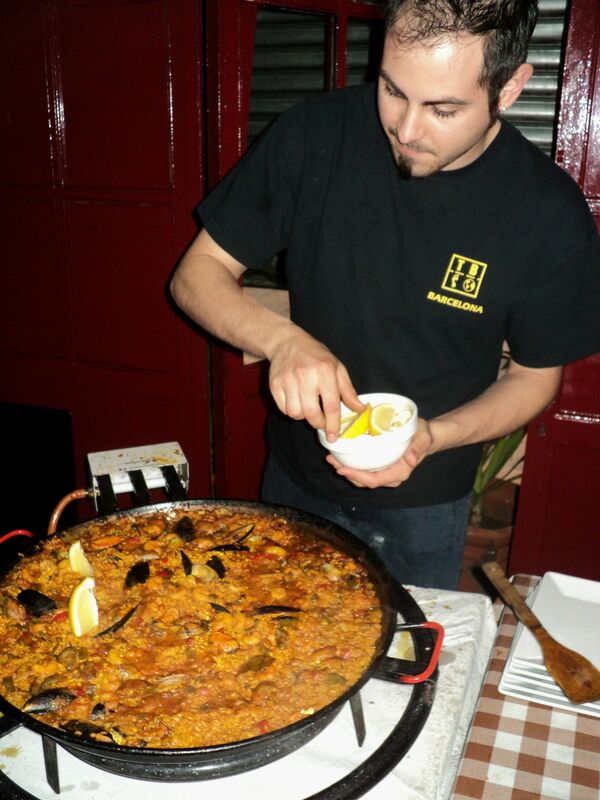 That night, we went to a cooking class, and learned how to make a Catalonian Paella. The recipe went like this, as far as I could tell. I have edited the huge recipe slightly to make it suitable for 3-4 people in a regular 12-inch skillet. First, make the sofrito: on your biggest burner, heat two tablespoons of olive oil in a pan and dump in a diced onion. Fry it until translucent. Add three tomatoes, pureed, a handful of chopped parsley, a tablespoon of smoked paprika, a teaspoon of salt, and two cloves chopped garlic. Stir and fry until fragrant. Stir in one diced red bell pepper. Pour in a cup of white wine, and allow alcohol to cook off, stirring to deglaze the pan, about 5 minutes. Clear out a space in the center of the pan. Take your cleaned mussels (about 3 per person is enough) and heap them in the center of the pan. Cover them with the sofrito mixture and cook for 4-5 minutes. Do the same with the small cleaned clams (4-5 per person) and cook for 3-4 minutes. Stir in a handful of cleaned peeled shrimp per person, and add a pinch of two of saffron threads. Add arborio rice to the pan: one handful per person eating. Stir for two minutes, to completely coat the grains in oil and to toast them slightly. Pour in enough water and chicken or fish broth (in a 1-1 ratio) to completely cover the rice. Stir gently to combine. Bring liquid to a boil, then lower heat and cover, with no stirring, for 15-20 minutes. You can test the rice during this time to see if it is still crunchy. If it is, you can add more liquid and re-cover. When the rice is done, turn the heat up and cook for a further 10 minutes to toast the rice slightly. Slice a lemon and place lemon slices evenly throughout pan. Serve with sangria. 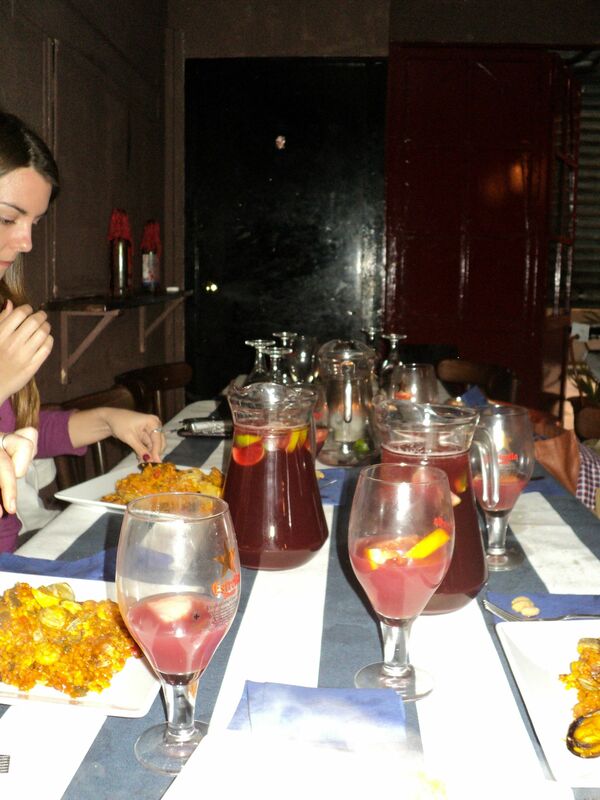 We also learned how to make sangria, and managed to drink about four pitchers between the six of us. Basically, take a lime and slice it up into the bottom of a pitcher. Add two big spoonfuls of sugar and gently mush the limes and sugar together using a muddler, if you have one, or a potato masher if you don’t. Add four large ice cubes to the pitcher, then add two shots of brandy and two of white rum. Shake the pitcher to cool the alcohol slightly. Fill it halfway with red wine (not good wine, our chef said. Save the good wine for good dinners) and the rest of the way with orange fanta. Yes, orange fanta. It sounds awful, but tastes amazing. Take a knife or a long spoon and quickly stir the pitcher in a circle. If you watch carefully, you’ll see the ‘sunrise’– the mixing of alcohol and soda. This is seriously easy to drink, people. Serve it with caution, or small glasses. 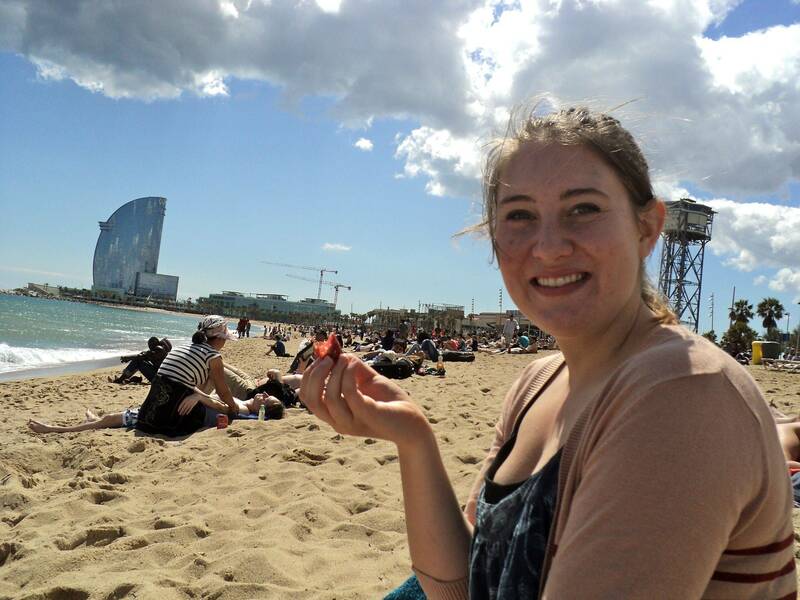 The next day was bright and sunny so we stopped by a market for goat cheese, sausage, and corn cakes and took ourselves down to the beach! 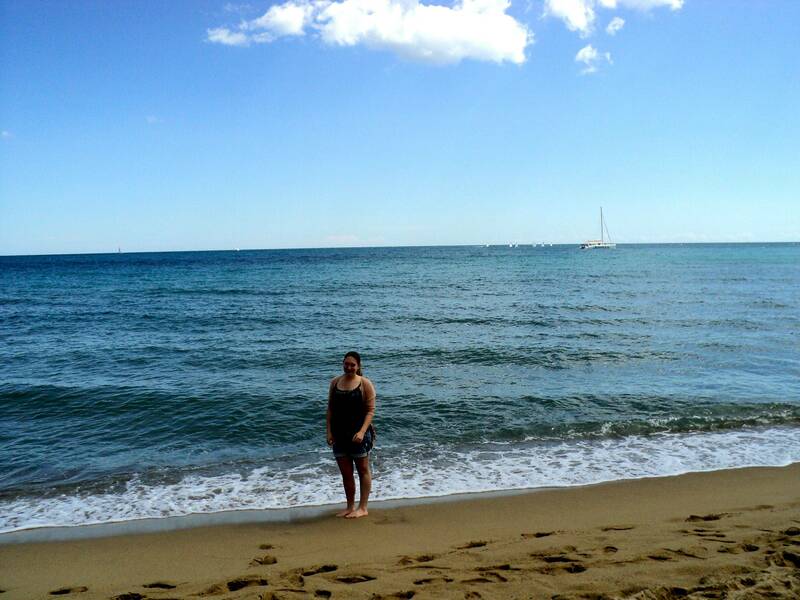 It was still a little too chilly to go in the water (below: Amalia’s ‘but my feet are cold’ face). I borrowed the second book in the Hunger Games series from our hostel and spent most of the day sunning myself and reading. It was a rather perfect end to our vacation. 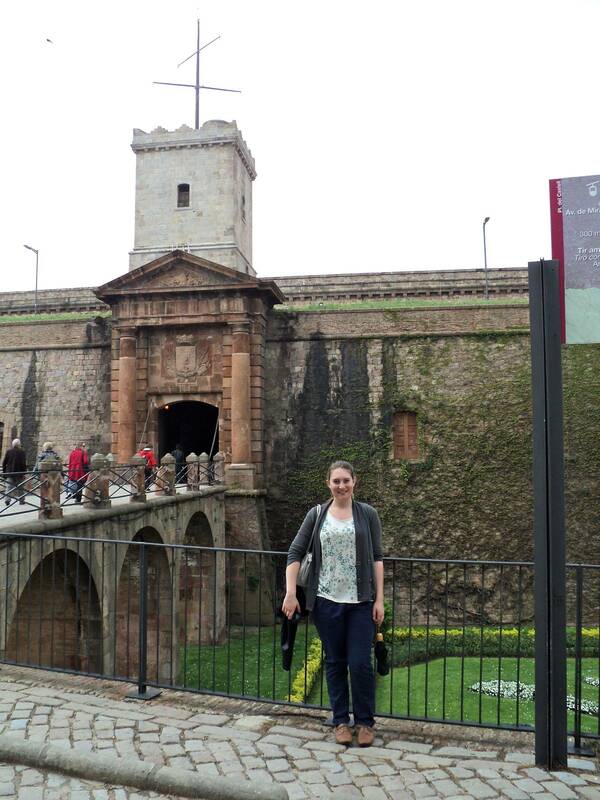 To see a few more photos of Montjuïc and our cooking class, go here. The last photo is from our last dinner in Barcelona, at an amazing organic restaurant that had–to my joy–a salad bar mostly composed of bitter greens. It was amazing. So glad that you took a cooking class. What a terrific vacation! 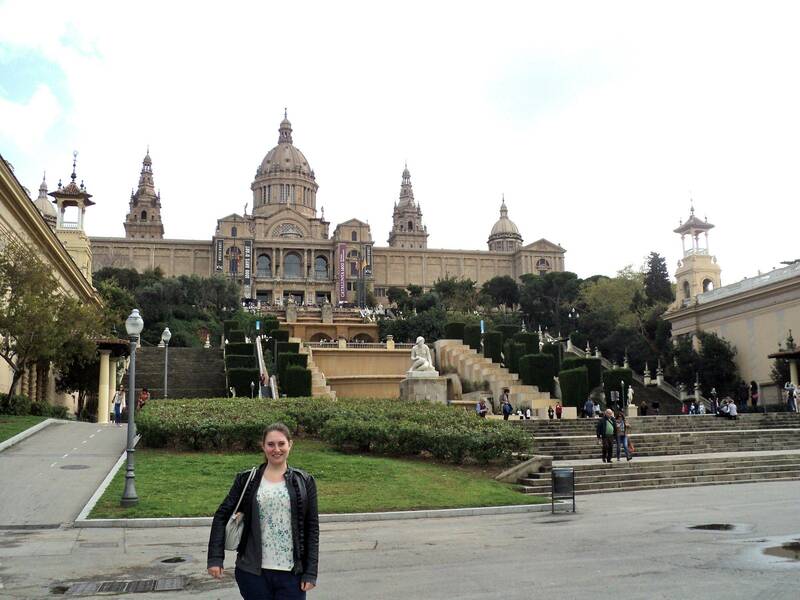 And I like the picture of Amalia in front of the Palace of the Arts! Watch out for that Sangria. Was the Blinding of Sampson the painting by Rembrandt? I tried to find out where it resides (“ubi sit” in latin according to Charles) but that painting seems to sit in Franfurt. 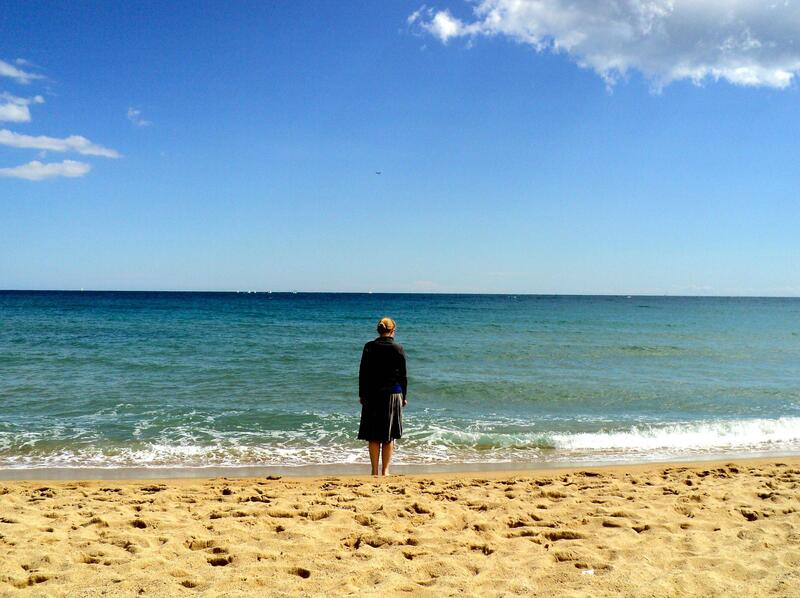 Anyway, thank you so much for sharing this amazing travelogue. Have you considered sending a link to the Camera? They might be interested in a few posts from a Boulder Native in Mittleuropa. No, it wasn’t the famous Rembrant, and it’s driving me crazy that I can’t find a list of works at the Palace of Arts. I guess it’s not a well-known artist. You obviously have time for this because it’s not like you’re a full time student and traveling the world and like to sleep or anything . . . but I really hope that you are collecting all these recipes you variously mention or describe. Because I would purchase that cookbook!